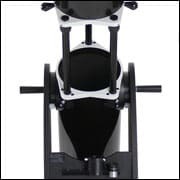 The Infinity 102mm is the largest aperture refractor scope available from the Meade Infinity line, and, especially given the reasonable price point, it’s worth the upgrade. While lower powered scopes might be fine for daytime viewing, the 102mm is perfect for enjoying celestial views of the moon, planets, and even some bright deep-space objects. Unlike many scopes, the image is corrected to appear right side up, so it can be used to enjoy views of nature during the day as well. In this Meade Infinity 102mm Altazimuth Refractor Telescope review, we share information on its features and performance. What Is the Meade Infinity 102mm Altazimuth Refractor Telescope? Designed for beginners who want to know what a proper telescope can do, the Meade Infinity 102mm Altazimuth Refractor Telescope offers a relatively large aperture and long focal length to allow clear views of objects throughout the solar system. It’s a refractor, not a reflector, so there are no mirrors to adjust and maintain. Just mount the scope to the included tripod, and you’re ready to get started. It includes a red-dot finder scope, which is straightforward and easy to use, but, like all finder scopes, should be calibrated during the day before pointing your scope at the night sky. The slow motion controls are handy for getting your field of view settled, and getting used to the concept of using them, but without an equatorial mount, it’s tricky to use them to actually track objects over time. The upright image may be misleading—many telescopes offer inverted images, and beginners who start with the Infinity 102mm may not know to expect this. This scope is not available directly from the manufacturer, but it is available through a wide range of online retailers, including Amazon and High Point Scientific. It may also be available at local brick-and-mortar locations of specialty camera or telescope shops near you. It’s worth shopping around a bit, because the pricing of this scope can vary rather significantly. Check a few options to be sure you’re getting the best deal. This telescope is designed for use by beginners, but it’s far from low quality. 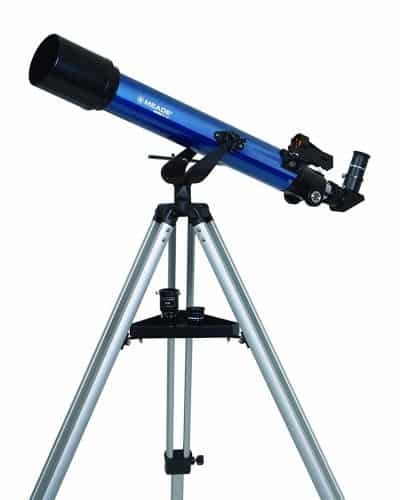 It was created with the serious home astronomer in mind, using solid materials and high quality optics, so you can expect excellent views of the planets and the lunar surface. Check out the included planetary guide for help deciding what to view, and in locating it in the sky. The corrected image (right side up instead of upside down) makes the scope easy to use during the day as well, perfect for viewing distant landscapes or wildlife, though it’s far too high powered to purchase strictly as a daytime scope. There are occasional reports of the packaging including incorrect components, so be sure to check over the contents of the box to make sure all is as is it should be. If parts appear to be missing or are damaged, contact the seller for replacements. The best way to keep your scope in excellent working order is to protect the delicate internal workings from dust, moisture, and temperature extremes. When using your scope outdoors, always make sure the weather is cooperating. Rain can easily work its way into the optic tube and cloud your view. If you use the scope outdoors in cold weather, allow it to come back to room temperature before storing it to keep condensation from collecting inside it. Dust can be avoided by using a cover when the scope isn’t in use, or by storing the scope in a carrying case. 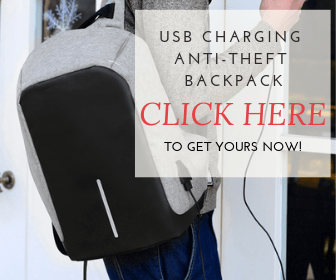 The latter is also ideal for travel, and may be worth the added investment. Make sure to store your scope away from extremes of heat and cold. An unheated garage or overheated attic can cause the optics or their mounts to warp, making it all but impossible to focus. Meade offers a 1-year warranty on the materials and workmanship of the product. Depending on where you purchase your scope from, you may also get a 30-day money back guarantee, tech support, and other benefits. Check to see what’s available when you purchase your scope. If you’re willing to put a bit of money into a beginner’s scope, you won’t be disappointed with the Meade Infinity 102mm Altazimuth Refractor Telescope. It’s got great viewing capabilities for both day and night, and though dim, deep-space objects are a bit beyond it, there’s plenty to see a bit closer to the earth. 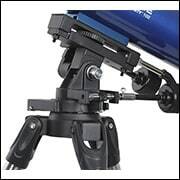 The slow motion controls are a great feature to play with, but the altazimuth mount makes tracking tricky and means the scope isn’t suitable for astrophotography that requires long exposures. 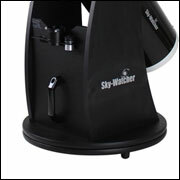 While the components of this telescope aren’t as sturdy as more expensive models, they’re still high quality. You’ll get the full experience of a high-end scope, and by the time these components start showing their age, you might be ready to make the upgrade to something even more powerful. 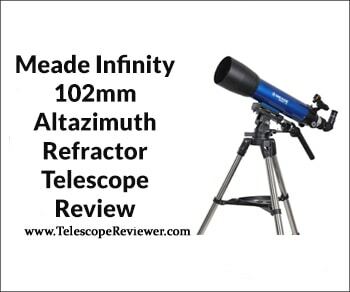 Are you a fan of the Infinity line of telescopes from Meade? Share your tips, tricks, and experiences in the comments below!